The FCPP use different taxonomic referential books to establish a neutral criteria between each information resource. The classification of species is complex and change often, reason by which some scientific names can vary depending of the scientific criteria. The classification of the Vertebrates Museum of the University of Panama and FCPP follow the reference of Mammals of the World book, edited by Wilson et al., 2005. However, we also consider relevant another references for New World Primates, like the Action Plan for Mesoamerican Primates (1996), wrote by the Primates Specialist Group and the International Union of Conservation Nature (IUCN), edited by Ernesto Rodríguez Luna, Liliana Cortés-Ortiz, Russel Mittermeier and Anthony Rylands. 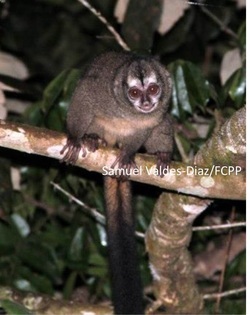 In this resource, the Panamanians biologist Jacobo Arauz and Ariel Rodriguez did a special contribution to obtain an idea about the distribution of each subspecies of Panamanian Primates. Maps and references of other sites were evaluated and facilitated by Professor Felix Nunez from the University of Panama. Recent information about each Panamanian taxa will be published soon in the All the World Primates book, edited by Noel Rowe, where FCPP is contributing with history and taxonomic information as well biology and conservation status of seven subspecies from the 13 that Panama has. Classification criteria are based in pelage coloration, body size, skull morphometry, bones measurements, dental formula, vocalization patterns, group size, group structure, DNA, between others. The world species classification is of huge importance to help to identify unknown species or species in high risk of extinction. International institutions uncharged to evaluate the conservation status of all the world species are the IUCN and the Convention on International Treade in Endangered Species (CITES), but those are in need of direct information from different countries to obtain a realistic overview about their status. Some classification criteria used in the past have been controversial after the innovative use of DNA. Thus, the criteria related with taxonomy have been reevaluated and some of them have created polemic issues between taxonomists. 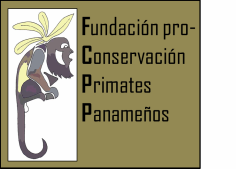 In the following list, FCPP present all the subspecies of non-human primates from Panama, categorized in conservation urgency order. 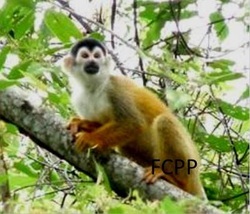 Most of the pictures correspond to the real animal observed in the wild by FCPP personnel. Other pictures have been donated by friend scientists that had visited Panama. Photo: Pedro Méndez-Carvajal at the Florida Museum of Natural History, reviewing the primate’s collection, September, 2007. With only 145 individuals remaining in the last vegetation left in Azuero Peninsula south region(Méndez-Carvajal & Ruiz-Bernard, 2009). It was identified in 1937 as Ateles azuerensis, in Rio La Vaca, Coto Region, Chiriqui, however it has lost almost 90% of their original distribution being at the border to be extinct. The FCPP is monitoring its groups every year and keep environmental education in some areas of Azuero, but we need more funds to cover more areas and find more groups not sighted yet. 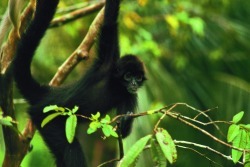 It is considered a subspecies of the red spider monkey, its scientific name is Ateles geoffroyi azuerensis. With only 3000 individuals, it is a subspecies from the Azuero region (Méndez-Carvajal, 2009). It is still surviving around the farms and cattle ranches in Azuero Peninsula, but hunting activities and deforestation are exterminating this endemic subspecies and is now considered critically endangered. 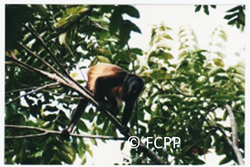 The FCPP is leading an annual survey and environmental education activities in some regions in Azuero, to keep protecting this primate. It is considered as a subspecies of the Coiba howler monkey, its scientific name is Alouatta coibensis trabeata. This is a subspecies that lack of direct observational studies. However it has been evaluated hypothetically with around 4,755 individuals remaining in the wild, in at least 10 zones in the west part of Chiriquí Province (Rodríguez-Vargas, 2003). It is considered as Critically Endangered due to the high deforestation and pets trade activity. Some conservational efforts have been done by the Waligora family which are organizing a sanctuary for this primate at the Barqueta region in Chiriquí. The FCPP will be starting a campaign to find biologist students from Panama that could be interested to help these primates to do not disappear for ever. It is scientifically classified as Saimiri oerstedii oerstedii. It was identified as endemic subspecies of Panama, living in a small section of the Tuira River, Chepigana, Darien Province in 1866. There is no study for this animal since its discovery. FCPP consider that it is necessary to find them to keep running studies related with its survivorship and actual population. It is considered still alive since the area where this primate was reported is the most forested area in our country, reflecting the importance of keeps the Darien forest. Its scientific name is Ateles geoffroyi grisescens. This is an endemic monkey to Panama and Colombia, with distribution range from the central east Panama Province, Darien Province to the Colombian Choco. 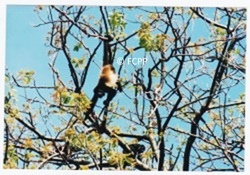 The FCPP has been counting these primates for the first time in 2008 at the Chucanti Natural Reserve in the Maje mountain chain, Darien Province. This primate is declining in some areas of Darien due to the hunting activity and the high destruction of their habitat. Its scientific name is Ateles fusciceps rufiventris. 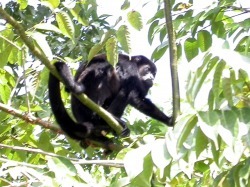 This is an endemic Panamanian monkey, specifically unique from CoibaI sland and Jicaron. It has been little studied since 1977 when it was briefly described by its group characterization. Actually the FCPP is monitoring its population for the first time with the objective of calculating the actual amount of howlers living in the island and study some social structural parameters and behavior specifically for Coiba howlers. It is one of the few howler populations living in a real continental island. It is considered as Vulnerable and its scientific name is Alouatta coibensis coibensis. Has been poorly studied in Panama, excepting for some studies carried out in Barro Colorado Island Natural Monument, where there are 22 individuals actually living into the island. They are found trough the entire northern Caribean coast of Costa Rica to Darien, in interrupted forest, including Portobelo National Park, San Blas, and the Alto Chagres National Park . Their threats are the high deforestation and hunt activity. The FCPP is planning to incorporate this subspecies in the annual surveys to obtain realistic information about their actual conservation status in Panama. These monkeys are considered as Critically Endangered to Extinction. Their scientific name is Ateles geoffroyi panamensis. 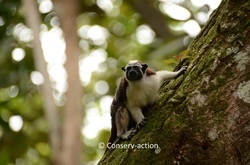 This monkey is located from Costa Rica to the western-central Panama, declining in its population amount due to the hunting activity as they are associated with damages in farm activities. This monkey is poorly studied and the only long-term studies have been done in BarroColoradoIsland, in Panama. However, they real situation is probably getting them to be partially extinct if an environmental education plan is not developed around the farm community. 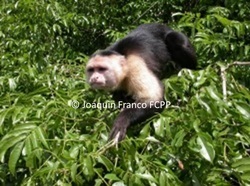 The FCPP has included this Primate to the annual counts for those populations living into Azuero Peninsula, and Coiba Island and also environmental education have been started to keep tracking those groups. It is scientifically named as Cebus capucinus imitator. Foto: Cortesía de Joaquín Franco. This monkey have been considered the real nocturnal monkey of all the Primates, as this is into de Anthropoid list, contrary to the Lemurs which are still Prosimian even with nocturnal activity. They have been utilized for biomedical projects by the Gorgas Commemorative Institute since the Panama Canal creation. 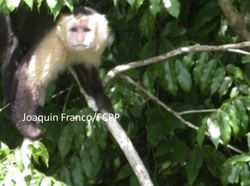 FCPP started in 2011 the first project related to the distribution and actual population of this species, including also circadian activity in the Panama Canal Zone. Its scientific name is Aotus zonalis. This monkey is located from the Panama Canal eastern side trough the forest found in the Pacific and Caribean coast, as well mountain chain of Alto Chagres, Darien to passing Panama until Colombia territory. 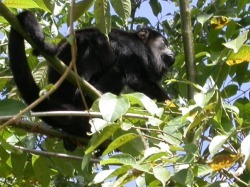 Thanks to its distribution in the east part of Panama, this monkey was considered well protected due to the good forest connection. However, recently migration of people from the western Panama have been threaded their habitat. This animal has no further studies and there are only one study by the FCPP in the Chucanti mountain zone, where we evaluated a population density of 2 individuals/km² and groups average of 6 ind/group. This primate is scientifically classified as Cebus capucinus capucinus. Is a monkey with a wide distribution, present in Honduras, Nicaragua, Costa Rica and western side of Panama until the Panama Canal watershed. It is considered as well conserved for the central mountain chain and the western canal watershed, but it is possible that could be vulnerable for those areas close to the town of Chiriqui, Bocas del Toro and Veraguas provinces. There are few studies for these Primates by the students of the Chiriqui University. The FCPP is planning to carry on more efforts to keep monitoring and help conserving these Primates. Its scientific name is Alouatta palliata palliata. Is the most studied subspecies in Panama, but only for the Panama Canal Zone and BarroColoradoIsland. It is distributed from the Panama Canal, Chagres, Darien and San Blas, to Colombia and Ecuador. It has been reported hunted in some non protected areas that claim further studies for the areas out side to the reserves and national parks. It has been used long time ago as protein resource for the American Army and Defense Forces of Panama as military practices to survive at the Panamanian jungle. There is no idea how many monkeys were killed for this trainings. It has been partially extinct in some areas of eastern Panama. Its scientific name is Alouatta palliata aequatorialis.